Almost two dozen irresistible Irving Berlin songs. A love-versus-career and city-versus-country story line with a triangular romance for a twist. Winningly edgy humor and show-biz realism. Tap dancing that is guaranteed to knock your socks off. Elaborate costumes. A cast that can do anything and everything – and, to top it all off, do it in the round. And finally, a year’s worth of holidays that will have you marking your calendar well in advance. In short, “Holiday Inn,” the recent Broadway musical based on the hit 1942 film that starred Bing Crosby and Fred Astaire, is an old-fashioned charmer on every level, with just enough of a sardonic bite to make it feel fresh, and just enough nostalgia to pierce your heart. 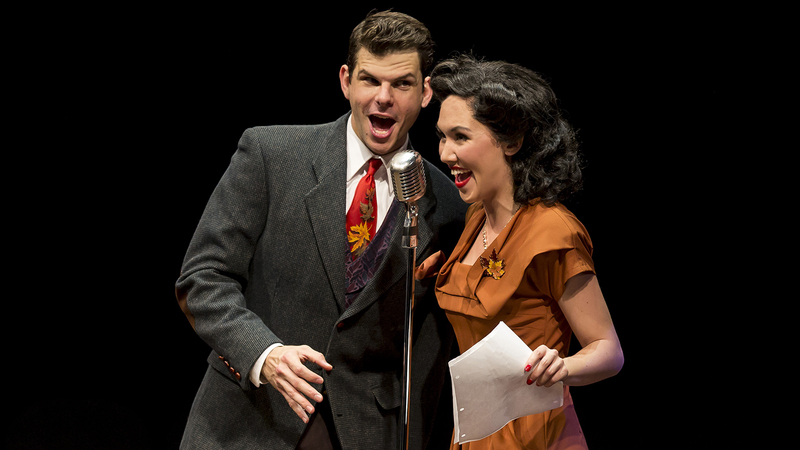 Like many great musicals, “Holiday Inn” is about show business itself, and about how the often rocky road to success is littered with talented people who can’t quite make it to the big time. Song-and-dance men Jim Hardy (Michael Mahler, the multiply gifted actor, singer, pianist), and Ted Hanover (Will Burton, an absolutely sensational dancer), are good friends and along with Jim’s girlfriend, the talented Lila Dixon (Kimberly Immanuel, a sparkler of a singer-dancer), they have become a popular trio on the New York stage (or “Fraudway” as Broadway is once referred to here). But, they haven’t quite piqued any Hollywood interest yet, and on Christmas Eve of 1946, Jim makes a big decision: Not only will he propose to Lila, but the two of them will leave show biz behind and start a family, moving to the rundown farm in Connecticut he recently bought. This is not quite what the success-driven Lila has in mind, so she heads off to continue the act with Ted, who, much to Jim’s chagrin, becomes her new boyfriend. The initial “Blue Skies” of life on the Mason Farm soon seem cloud-filled for other reasons, too. Not only is he heartbroken about Lila, but Jim learns the farm has serious back taxes issues that must be paid (tiny, clarion-voiced Patrick Scott McDermott, as the boy messenger for the bank, easily steals every scene with his comic timing and shrewd delivery). And the farmhouse is in serious need of work. It also comes with the “visits” of two former occupants: Linda Mason (Johanna Mckenzie Miller, an actress-singer-dancer of immense natural warmth and honesty, whose beautiful voice is among the show’s many highlights), and Louise (a sensational comedian and belter), the live-in repair person. Having lost the memory-filled farm, suffered an early sense of defeat as a performer, and turned to teaching, Linda is a natural love interest for the heartbroken Jim. But despite their ideally matched outlooks and loneliness, both are wary. The show – superbly directed and choreographed by Denis Jones, who is reprising his Broadway work here, but has done a terrific job of adapting it to Marriott’s very different configuration – then proceeds to move swiftly through more than a year of holidays (Thanksgiving, Christmas, New Year’s Eve, Valentine’s Day, Easter, July 4th, and on). And along the way romances and careers get figured out, and the Mason Farm becomes (of course) the profitable stage for shows that are only performed on big public holidays, with the reminder that actors tend to work on the days when most others are at leisure). A romantic and a cynic, Berlin also was an unabashed patriot (remember, the film came to the screen during World War II, although this stage version unfolds a year later), and the show includes a phenomenal pairing of “Song of Freedom” and “Let’s Say It With Firecrackers” that becomes a fabulous explosion of tap dance, complete with an eye-popping jump-rope routine. Berlin could even write a prescient song about keeping in step with change (“Marching Along With Time”), which probably haunted him in the final years of his life when rock ‘n’ roll replaced his brand of music. The show’s ensemble of dancer-singers (with zesty supporting turns by Elizabeth Telford and Lorenzo Rush Jr.) is exceptionally skillful and attractive and looks great in what must be the hundreds of costume confections designed by Sally Dolembo. And Scott Davis’ sets, Jesse Klug’s lighting, Anthony Churchill’s projections, and Robert E. Gilmartin’s sound are all top-notch. So, most crucially, is Ryan T. Nelson’s music direction, and the orchestra, led by Patti Garwood. In short, you could not wish for a more ideal alternative to the familiar “holiday show” lineup than “Holiday Inn.” And I wouldn’t be at all surprised were this to become a new vintage version of a perennial favorite. “Holiday Inn” runs through Jan. 6, 2019 at the Marriott Theatre, 10 Marriott Drive, Lincolnshire. For tickets ($50-$60), call (847) 634-0200 or visit www.MarriottTheatre.com. Running time is 2 hours and 25 minutes with one intermission. Note: The Marriott is now presenting Michael Ingersoll’s Artists Lounge Live concerts in which supremely talented music theater performers pay homage to all eras of the American songbook. Coming up soon is Evan Tyrone Martin in his show, “An Unforgettable Nat King Cole Christmas” (Dec. 18 at 3 p.m. and 7:30 p.m.). The 2019 lineup includes: Heidi Kettenring singing the songs of Karen Carpenter in “We’ve Only Just Begun” (March 17, 2019 at 1 p.m. and 5 p.m.); Chester Gregory in “Higher and Higher: A Feel-Good Rock ‘N’ Roll Shindig” (Aug. 25, 2019 at 1 p.m. and 5 p.m.); and Jared Bradshaw in “Swinging on a Star: A Salute to Bing Crosby and the Andrews Sisters” (Dec. 17, 2019 at 3 p.m. and 7 p.m.). call (847) 634-0200 or visit www.artistsloungelive.com.